Last week, we had the wonderful opportunity to travel to Sea Island for the Southern C's Summit - a conference for creative entrepreneurs. 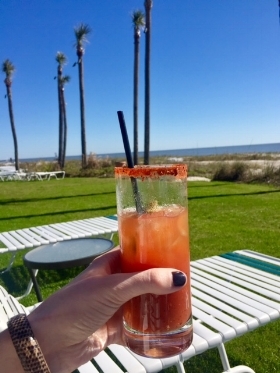 On the last day, after saying good-bye to our new friends at brunch, we took ourselves and our homemade bloody marys straight to the beachfront lounge chairs, for one last beautiful view. It was a little chilly, and man did it get us ready for summertime! So this weekend, you can find us on a patio with a bloody in hand, loving this warm winter weather. We've ordered and made a few bloody marys in our day, experimenting with various mixes and homemade options, and we have officially found our favorite recipe. And it's actually really easy and affordable! We also included some tips for creating a fabulous bloody mary bar - cause the only thing better than a bloody is a bloody bar! For proportions, we typically do 1/3 vodka and 2/3 zing zang. For a stronger drink you can go half and half. For the pickled okra, olives, and pickles, we recommend going to the olive bar at Whole Foods. They have the best spicy pickled okra, lots of varieties of olives, and the best homemade dill pickles! !